You have been sucked in to the hype of the Ashes or seduced by the razamatazz of Twenty20 and want to know about the game that is loved by hundreds of millions of men and women around the world. For me it all started in 2005 when I stumbled upon the greatest cricket match of all time. I was a football fan. My Dad thought I might be interested in the tense conclusion of the Edgbaston Ashes match. It changed my life as I was gripped by the epic battle of supreme athletes unfold in front of me. I wish when I started my journey into cricket that I had this eBook. It would have made learning about cricket so much easier than reading stuffy Rule of Cricket books. It’s the perfect eBook for all the women around the world who want to give cricket a chance but have no idea where to start. 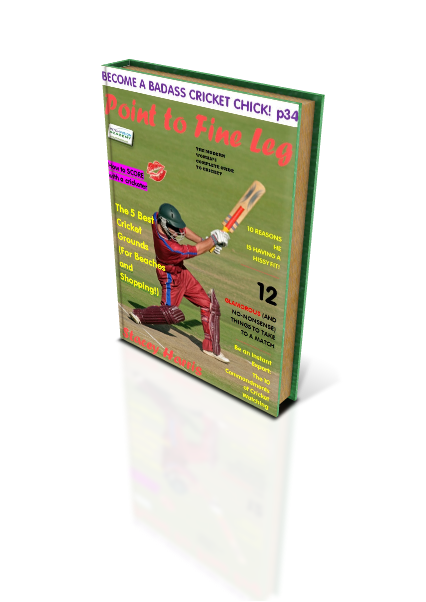 When you buy this eBook you will know everything you need to blag your way at any cricket match, from a Twenty20 match on TV through your boyfriend's village match all the way up to a Test match at the ground on a blazing hot summer day. All you need to do to get instant access to the download is click the green Buy button. Please note: this is an online eBook that is available instantly online. There is no physical product to be delivered so you get instant access to the download. Right click and "Save Target As..." to instantly download the eBook.